After the rebadged thing, here is the original. 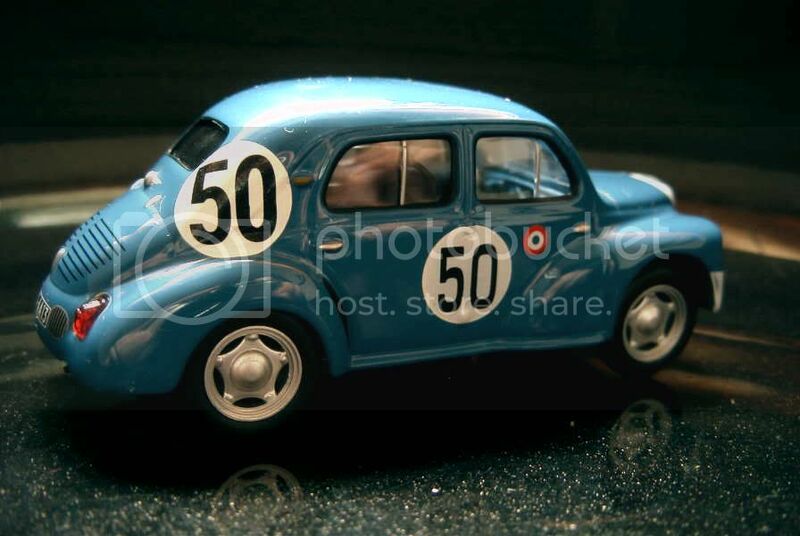 Designed during the war, the Renault 4CV became the symbol of the return of peace and prosperity. It also was the first really popular French car, giving access to motorization to the country’s working class which up to then had to content itself with motorcycles and bicycles. 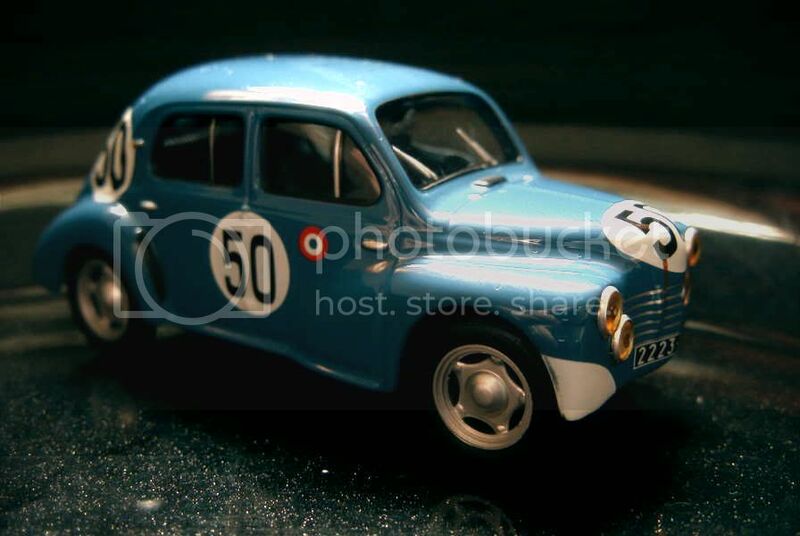 As a matter of fact the 4CV became the first French car to be produced in more than a million copies. In 1940, the German invaders put their hands on virtually all of the French industrial facilities. Renault was a jewel among the booty. Not only was it the second automobile manufacturer in the country after Citroën, it was one of the main trucks producers, and was heavily involved in aeronautics (the company had built aircraft engines since the birth of aviation and had bought airplane manufacturer Caudron during the late Thirties) and armoured vehicles (Renault was a main tank producer since the introduction of the FT17, the first modern tank, back in the Great War). From then on, Renault had no other choice than support the Third Reich’s war effort. 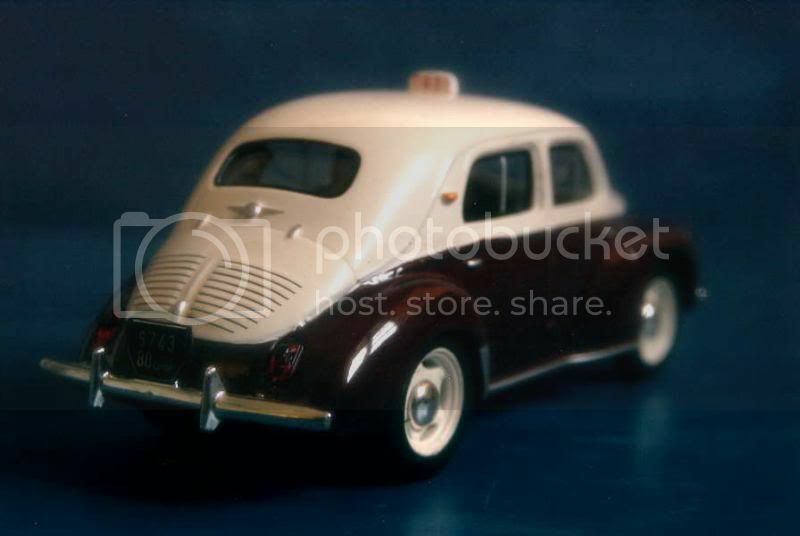 Nonetheless, as soon as 1940 the company’s designing team started to imagine what a postwar Renault would look like. Working in utter secrecy, far from the preying eyes of the Germans, the engineers were able to produce a prototype in December 1942. After miraculously escaping from an Allied air raid which flattened most of the Billancourt factory, the car was able to undertake its first discreet road tests shortly after New Year’s Day, 1943. 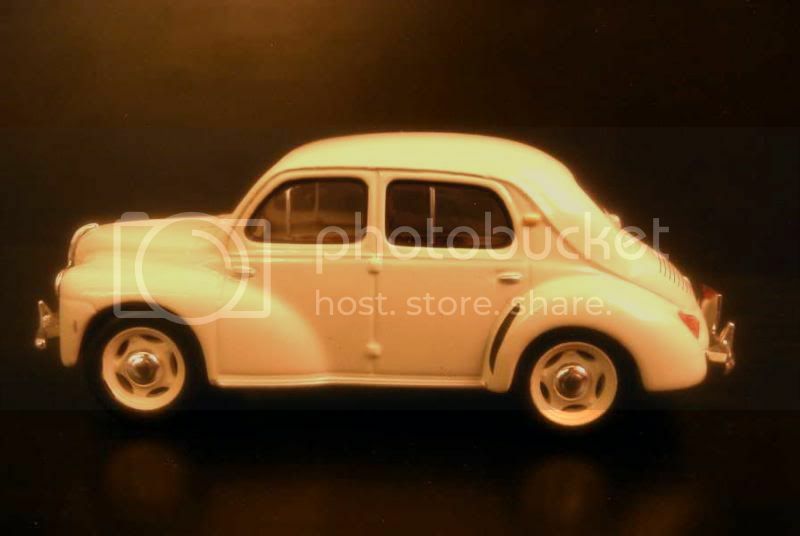 A very compact car, the 4CV prototype was a rounded two-door saloon built in aluminium. It was fitted with a rear-mounted four displacing 760 cc and, despite its modest output, the lightweight car can achieve a correct level of performance. 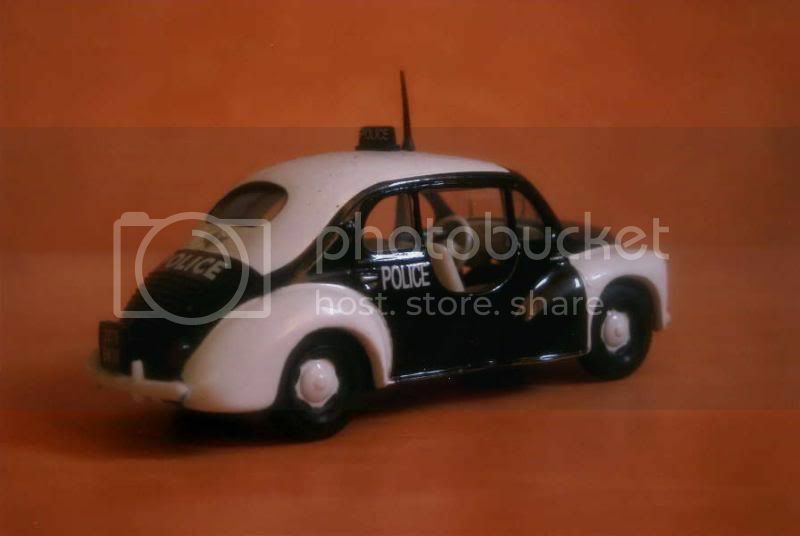 Many have noted a strong resemblance with the Volkswagen Beetle which, considering the Renault Juvaquatre-Opel Olympia connection, was probably not a coincidence. Several prototypes saw light during the long and difficult development of the car, which had to be suspended every time the German officials supervising the factory suspected anything. The main evolution of the 4CV during this period was the addition of two more doors, making it a tiny (3.66 meters long) but practical car. When this last prototype, now very close to the production model, appeared in November 1945, the war was then over. Many changes had taken place at Renault, the new French authorities, eager to grab the huge factories of the manufacturer, having thrown into jail its founder Louis Renault, charged with collaboration with the enemy. The old man had the good taste of dying while behind bars, allowing the government to make its plans come true. Well, he was actually helped by the poor sanitary conditions within the prison and the regular beatings of the wardens. Indeed, the circumstances in which was born what was to become the pride of the French state-owned industry for many decades to come was tantamount to murder. The 4CV was ready for production in 1946 but, by that time, the company was still rebuilding its widely-destroyed factory, so the launch had to be postponed. Despite being formally introduced during the Paris motor show in October 1946, no 4CV could be produced before August 1947. Nonetheless, it became the first brand-new car thrown to avid French motorists since the end of the conflict, easily beating the Citroën 2CV, still under development despite being on the Javel’s drawing boards since the late Thirties. The head of the newly-formed Régie Nationale des Usines Renault (RNUR), Pierre Lefaucheux, insisting on concentrating all efforts on a single model, the 4CV became the only passenger car produced by the company, another wartime project for a large, American-styled 11CV saloon being abandoned, except for its roomy estate variant that would be introduced as the Colorale. By the early Fifties, the 4CV had been improved to such an extent it wouldn’t evolve much for the remainder of its career. A huge success within France, it started attracting interest abroad. 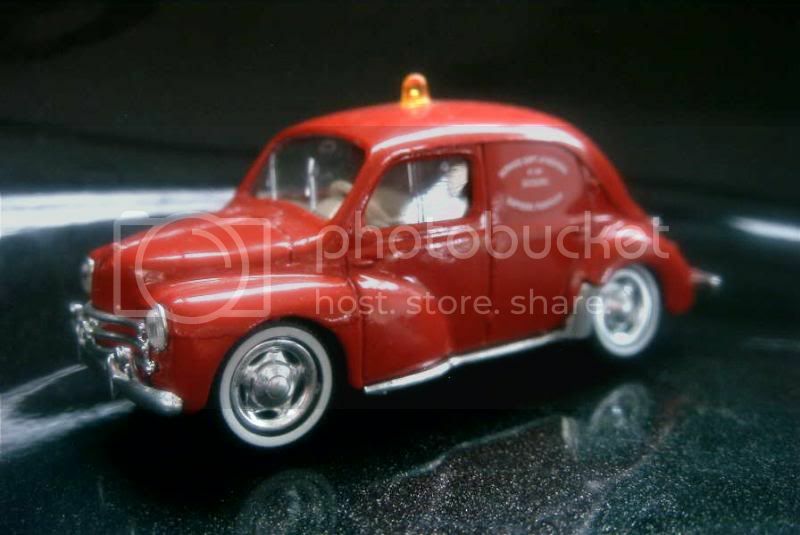 Renault’s Spanish branch Fasa launched its automobile production in 1951 with the 4CV. Hino built it under licence in Japan from 1953. Large quantities were exported in the whole of Latin America and, more surprisingly, in North America. Another large export market for the tiny Renault was Australia. 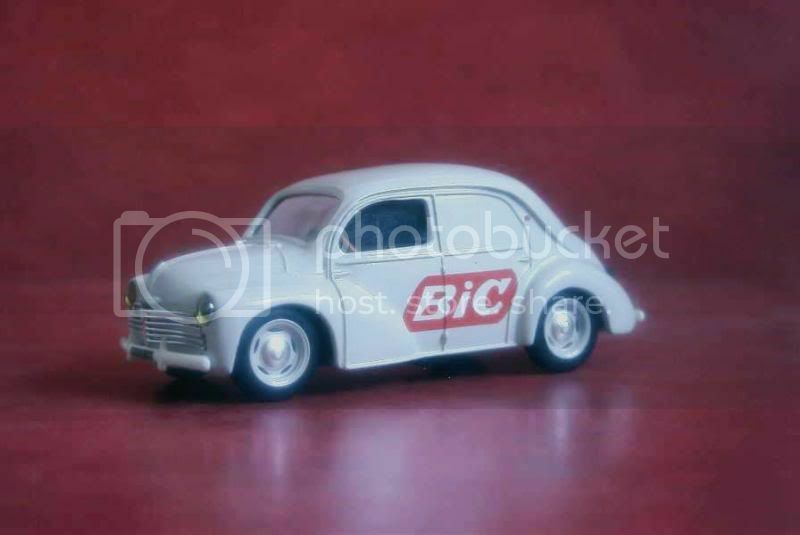 The 4CV was extremely popular as a base for many a little manufacturer constructing small series of special coupes or convertibles. A few among them were Alpine, V.P., Rosier or Autobleu. 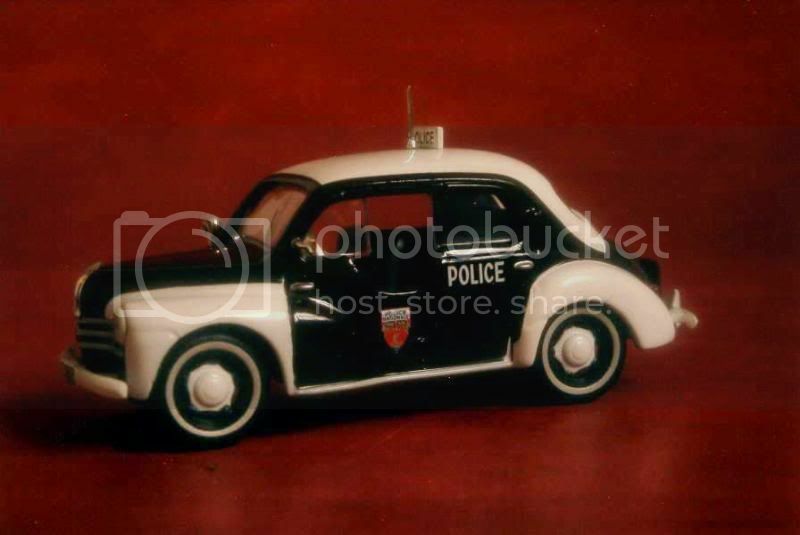 It was also adopted as a patrol car by the Parisian police. 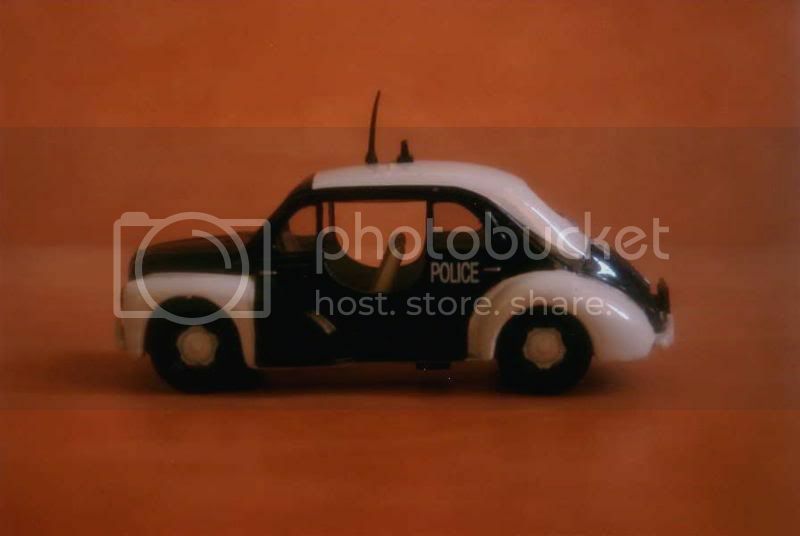 Such cars were soon nicknamed “voitures-pies” because of their paintjob (“pie” means magpie in French, so the expression is quite similar the English “Panda car”). 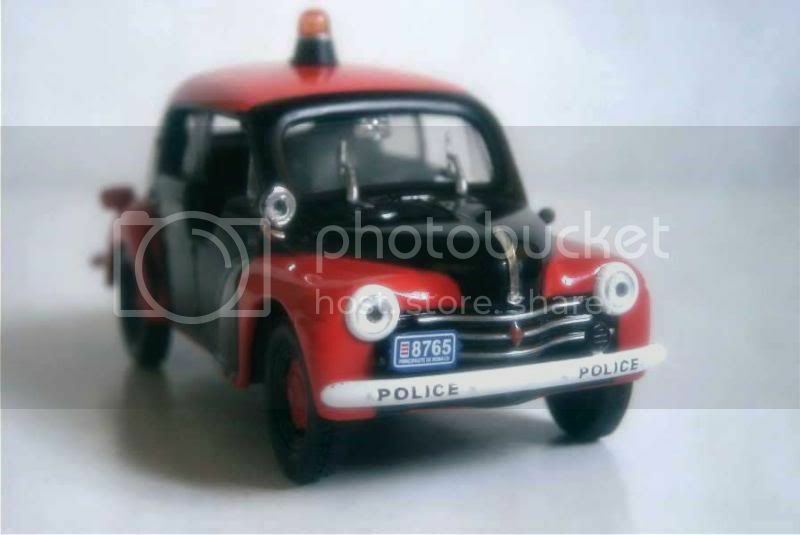 A voiture-pie would receive special doors allowing for quick exit, a two-way radio set and a 30 hp engine. 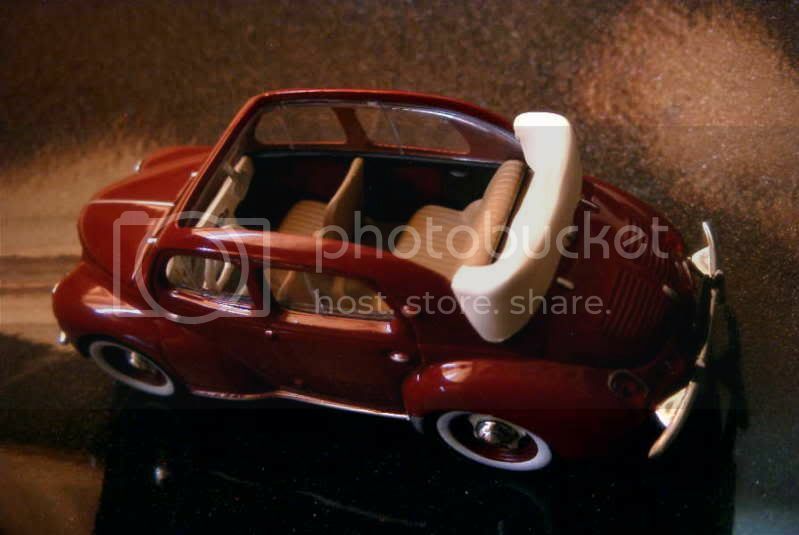 Though an electromagnetic “Ferlec” clutch, purchased from Ferodo, was available as an option from 1956, and an improved heater introduced two years later solved one of the car’s main problem, the 4CV wouldn’t change much as Renault’s attention now focused on the new Dauphine, a larger rear-engine saloon. The very last 4CV was built as late as in July 1961, when it was succeeded by the ground-breaking hatchback, the Renault 4. A big “s” at the end of the word “model”, as there are plenty of them this time! 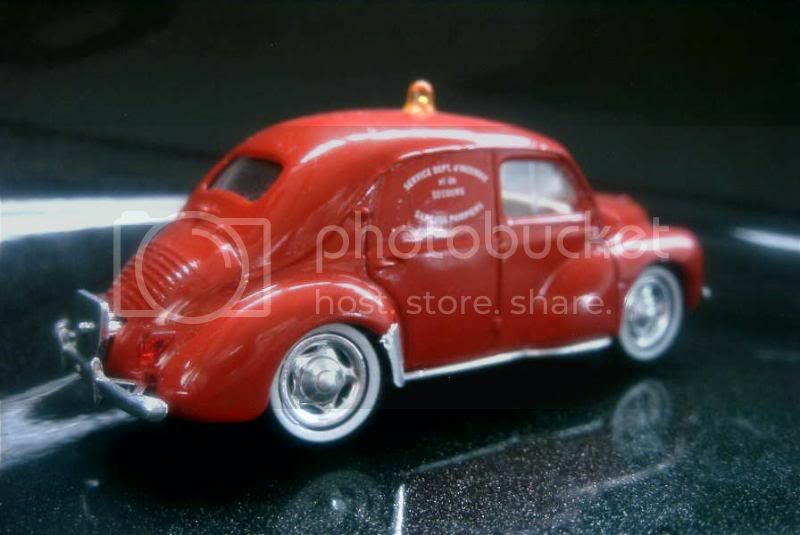 Eligor designed this scale model of the 4CV well enough, though nothing about it is truly extraordinary. Unfortunately the manufacturing’s standard of quality is far from great. I’ll give 11/20 to this model. 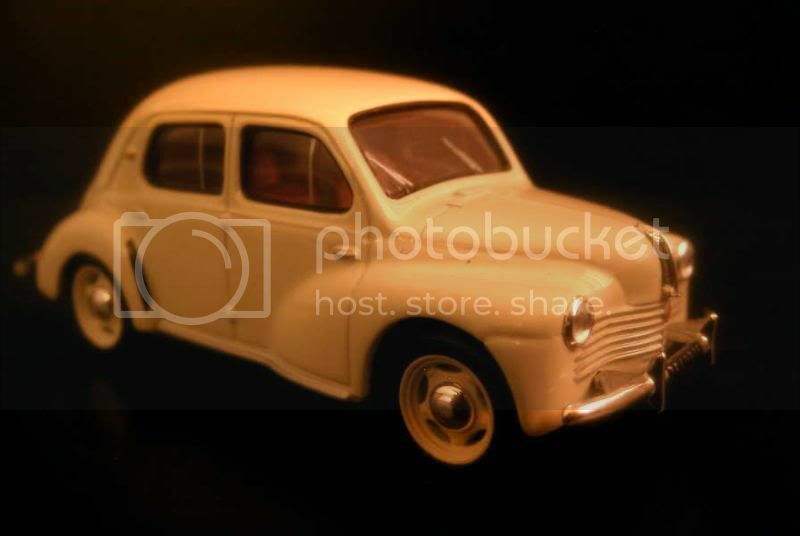 A nice 4CV overall but lacking in details. My remark about the door handles is obviously the same that the one I made about Ixo’s Hino, built with the same mould. Pleasant but probably not worth more than 12/20. 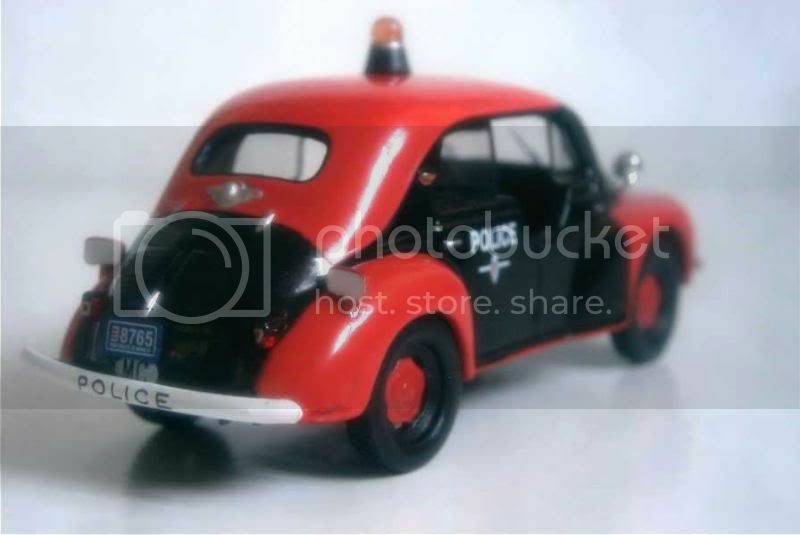 Certainly an original car, though unfortunately Ixo doesn’t reproduce any other Le Mans 4CV than this one. My rating is 12/20. 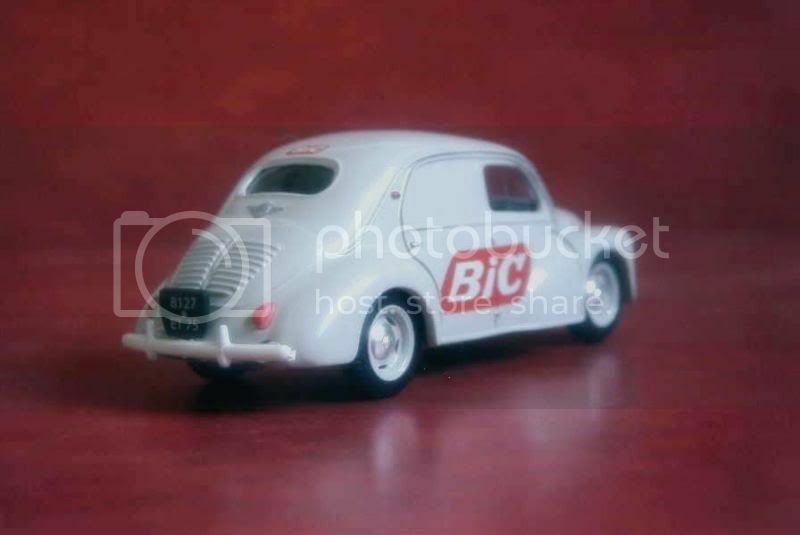 It’s basically a poor-quality 4CV with a “BIC” decal glued to it. Fine, there are many collectors of commercial vehicles out there, but are they gullible enough to buy such a model car? (I mean, to buy it new at 22.50 euros - I got mine for 2 euros, and I would have had regrets if I had spent more.) My rating is 7/20. 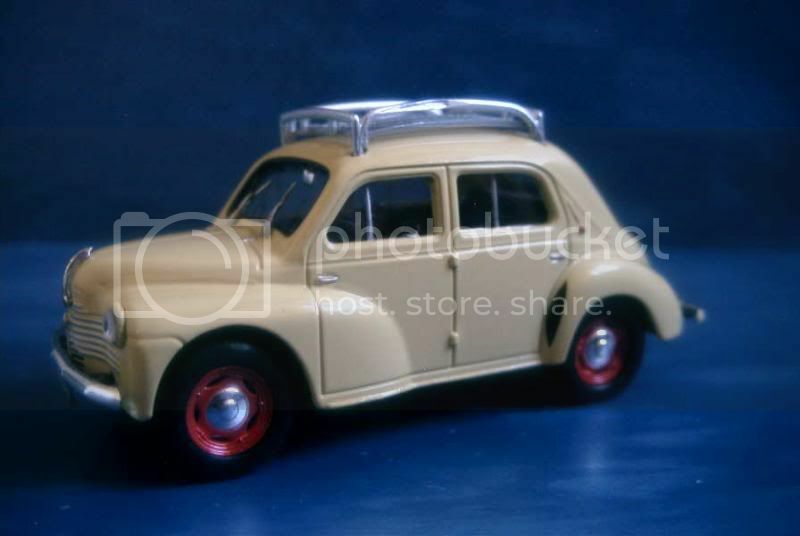 The open roof revealing a pleasant dashboard and the (uncomfortable) seats of the 4CV allows to distract from the flaws of the Ixo reproduction of the little Renault. My rating is this time a good 13/20. A simple reproduction, Solido-style some would say. It suffers from the very low ground clearance which totally changes the appearance of the car, and the absence of any decal on the registration plates. My rating is 8/20. 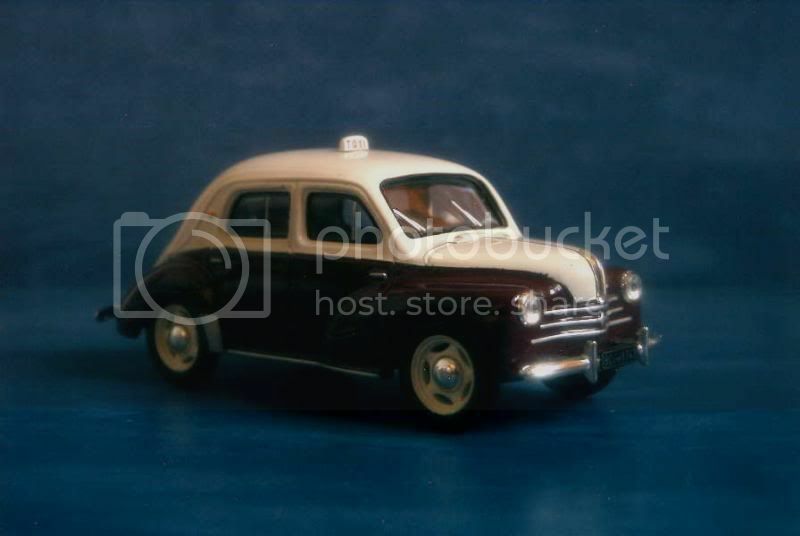 Ixo reproduced its 4CV as a Tunis taxi, not only changing the decoration but altering its mould to represent the new, simpler front grille introduced in 1954. Sympathetic, though not necessarily indispensible: 12/20. 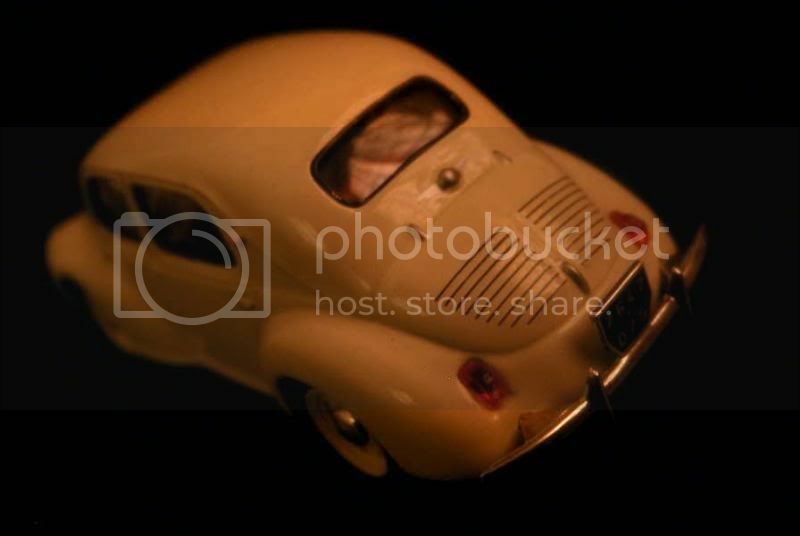 A rather pleasing rendition of a Paris voiture-pie. 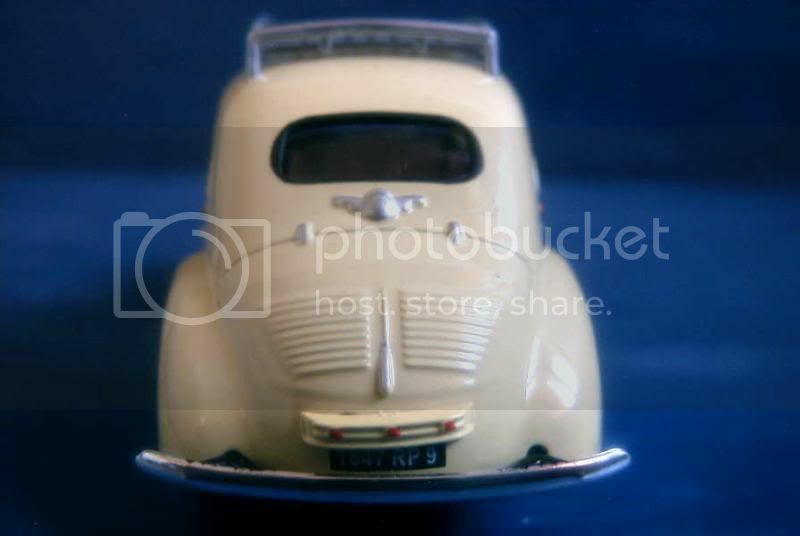 Ixo correctly reproduced the front side windows, which present an overhang over the cut-out doors - a detail I never noticed on pictures of the real car until I got this model - and enlarged the rear window. My rating is 13/20. Same car, different reproduction. Eligor’s mould is older and this cannot be hidden. Many omitted details and several mistakes justify a 6/20 rating. Eligor again, but this time with a brand-new mould. 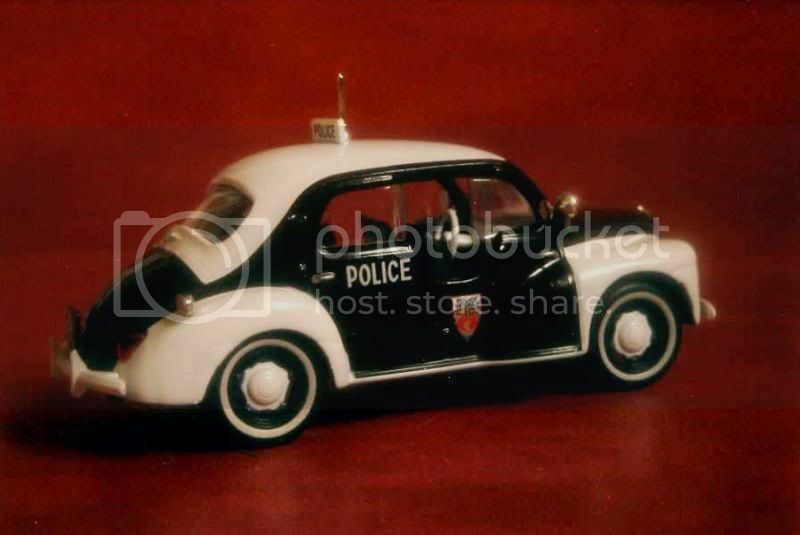 Following the popularity of the voiture-pie among Paris policemen, the tiny principalty of Monaco wanted the same car for its own constabulary. Here is the result, reproduced well enough to deserve a 13/20. Great models specialy the one from Le Mans. 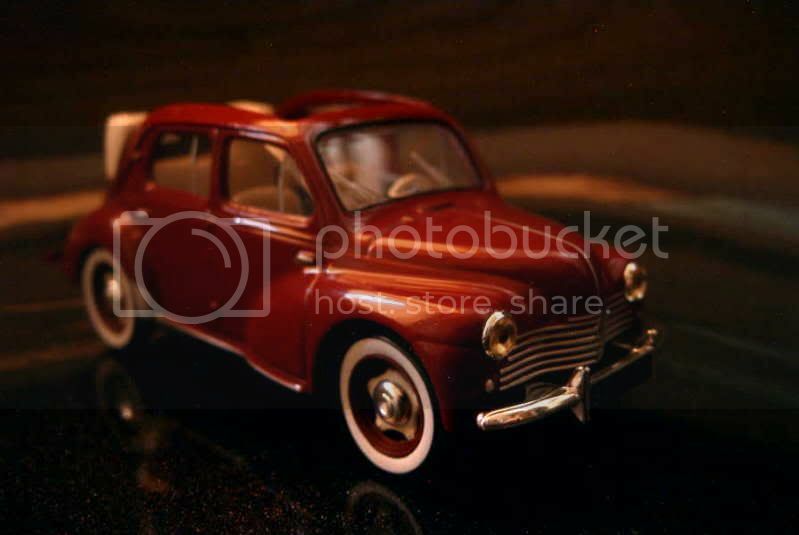 My collection is made of a lot of Models Models but I don´t have that one. Now that you said what your tastes regarding automobiles are, I'm not much surprised that you like this one! Thanks for exploring old posts!